ABBOTT PARK, Ill., April 17, 2018 /PRNewswire/ -- Let's be honest – as adults, our busy schedules can get in the way of our own self-care, and that includes getting the right nutrition. The numbers back this up: more than 1 in 3 adults over 50 still aren't getting the protein they need daily, according to new National Health and Nutrition Examination Survey (NHANES) data from researchers at Abbott (NYSE: ABT) and the Ohio State University. That's why Abbott is introducing Ensure® Max Protein – a 150-calorie nutrition drink with 30 grams of high-quality protein and 1 gram of sugar – to help adults kick-start their #healthgoals. This new nutrition drink gives adults all the perks of protein, from maintaining or rebuilding muscle mass to helping to satisfy hunger, in an easy, on-the-go option for our busy day. All without sacrificing on taste. 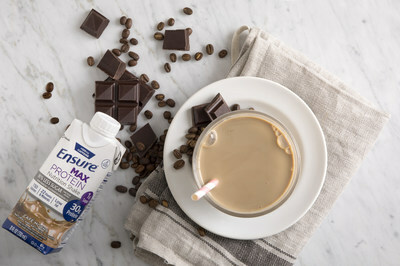 For the chocolate and coffee lovers inside all of us, Ensure Max Protein comes in two great flavors, including Milk Chocolate and Café Mocha. The Café Mocha flavor includes 100 milligrams of caffeine from Colombian coffee extract, which is as much as one cup of coffee, to help energize your day. Actress Kate Walsh knows the importance of protein and good nutrition for maintaining a healthy and active life. She is partnering with Abbott, the maker of Ensure, to help adults maximize their eating habits with simple daily changes. "As we age, our bodies change and so do our nutritional needs. In the last several years, I have made it a priority to understand exactly what my body needs to function at its best," said Kate Walsh. "Even with my busy lifestyle, I've improved my eating habits by finding simple ways to incorporate protein into my diet so I have energy to take on the day. I love that I can now have Ensure Max Protein on the go, and be confident that my body is getting the right amount of protein it needs." Staying energized and strong becomes more of a drag with age. That's why it's important to know how much protein you may actually need. A person weighing 150 pounds would need roughly 54 grams of protein a day, according to dietary guidelines.2 However, your protein needs change based on things like age, activity level or illness – and current recommendations don't take that into consideration. And, not all proteins are created equally – some proteins lack the essential amino acids that your body needs but cannot create. Research shows it's important to make sure that your diet contains high-quality proteins, that provide all nine essential amino acids, to help support overall health. "Abbott has always been about nourishing adults and helping them live stronger, healthier lives powered by the latest advances in science," said Abby Sauer, MPH, RD, a registered dietitian at Abbott. "For Ensure, helping adults reach their health goals comes in all forms – whether managing an illness or maintaining strength and energy. Our newest formulation – Ensure Max Protein – delivers strength in a bottle, so adults can stay active and tackle life's demands." Starting this month, Ensure Max Protein will be available nationwide at most major retailers and online. To learn more about your protein needs, visit Ensure.com. Krok-Schoen, J et al. Low Dietary Protein Intakes and Associated Eating Behaviors in an Aging Population: a NHANES Analysis. ASPEN 2018 Nutrition Science & Practice Conference. Dietary Reference Intakes for Energy, Carbohydrate. Fiber, Fat, Fatty Acids, Cholesterol, Protein, and Amino Acids. Institute of Medicine of the National Academies, 2005. Available at: http://www.nap.edu/read/10490/chapter/12#645.